Customers are tailor-making bespoke luxury products online in a style of shopping that's all about clicks, not bricks. in the US was an early adopter with the launch of , allowing shoppers to create their own shoes and accessories with a click of their mouse. Luxe legend is also renowned for offering personalisation services, from hot-stamping of initials onto leather luggage tags, to hand-painting of initials on hard luggage. The fashion house stepped things up a notch with the introduction of products for men. LV's signature grey check is complemented by a combination of initials, stripes and linings mixed and matched from a range of 22 different colours for wheeling suitcases, soft briefcases, keep-all bags and wallets. One local player keeping things personal is Nicholas Atgemis (above) of Sydney's . With bow ties now being paired with ever more casual attire, these tie-your-own beauties made from Italian woven and printed jacquard silk, velvet or wool, are hot to trot. "Customers start by drawing their own design or providing an explanation or a photo for reference," explains Atgemis. 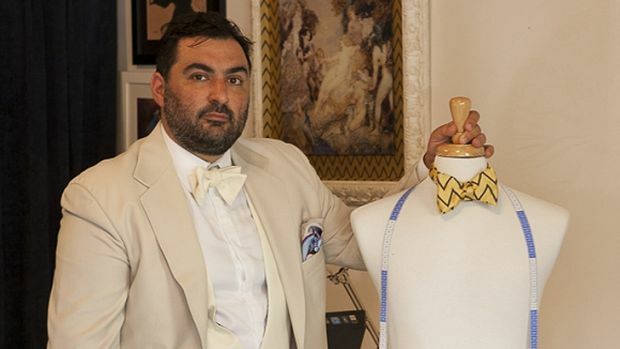 "We can guide them through the process of creating a bow tie themselves. This can all be done online or if they prefer to touch [the fabrics] they can come into the Sydney studio." Atgemis also produces silk-covered braces, cotton shirts, smoking jackets and velvet slippers to order with finishing touches including initials or a family crest. But while designing for yourself can be innovative fun, choosing a special look for your significant other can be a potential minefield. Michael Fallah - aka - says there's extra pressure on blokes to get it right when selecting a one-of-a-kind engagement ring. "It's often the most expensive piece of jewellery many couples will invest in," he says. "Designing a ring together takes away the guesswork and stress of the guy picking one that's ready-made." Couples can create their dream ring online or in Fallah's Sydney workshop, ensuring it's utterly exclusive from the size and type of gemstone to the metals and intricate embellishments. "I use sketches and CAD models to make sure I've captured all of the details the couple wants before I make up the ring," Fallah says. "They can even come in and watch me melting down the gold." Another front-runner in the bespoke stakes is by Jodie Fox (above), Michael Fox and Mike Knapp. The unique online store allows women to create what's billed as the "perfect shoe": anything from ballet flats to killer stilettos that cater to all widths of feet. There's a multitude of shapes, styles and heel heights to choose from, as well as a range of fabrics, leathers, colours and embellishments that can be added, such as bows and ruffles. Following a wave of success online, a Shoes of Prey concept store opened at Sydney's Elizabeth Street David Jones, followed by a design studio in Westfield Bondi Junction. And the brand's biggest coup: it recently launched at Seattle's department store in the US. "There are five more [Nordstrom openings] to follow: in San Francisco, New Jersey, LA, Washington and Chicago," Jodie Fox says. A similar concept is offered at . Benjamin Levi (above right), Lana Hopkins (left)and James Hopkins recently founded this website dedicated to one-of-a-kind women's bags. Customers create bags from scratch, first selecting a style – an envelope clutch, perhaps, or a satchel – then choosing the size, colour, pocket detail and inner lining as well as the type of stitching, buckles or monogram if desired. The bags are handmade from Italian and Turkish leathers. "Lana's husband and I are trialling the first man-bags to be launched half way through 2015," Levi says. The trend towards design-it-yourself isn't confined to fashion, or the biking world's cult for modifying fixies (fixed-gear bicycles). Michael Grassi, Henry Gresson and Tomek Archer have been providing affordable designer furniture that can be customized online since launching in October, 2013. "The idea originated when I was looking to buy a desk," Grassi says. "I was after something relatively simple, yet it had to have certain elements to suit my own space. But no-one was willing to tailor their product to my needs." All NOMI's furniture – dining and coffee tables, chairs and storage systems – is hand-made in Melbourne and delivered flat-pack. "Customers select their options: materials (timber or compact laminate), size, colour and finish and they can propose their own sizing. Rendering technology allows them to see their design come to life right before their eyes." Also in the pipeline are an upholstered chair, sofa, stools, homewares, an outdoor range and even children's' furniture. "People respond to the fact that they can add their own aesthetic to their chosen piece of furniture which in turn creates an emotional connection unlike an off-the-shelf purchase," Grassi says.